We are proud to have played a key role in developing theory and practice in the fields of children's play, and in health and well-being. We hope our our national guidance continues to help changing hearts and minds for many years to come. 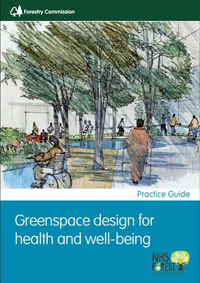 In 2010 Aileen Shackell Landscape Design was commissioned by the Forestry Commission and the Centre for Sustainable Healthcare to write Greenspace Design for Health and Wellbeing. 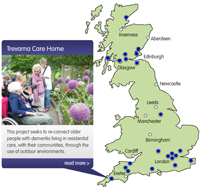 The publication highlights the benefits of being outdoors, and aims to inspire those involved with outdoor spaces to use them for therapeutic purposes. More specifically, it will also help those projects which form part of the NHS Forest in England. The guidance is relevant to all NHS facilities, from the largest hospital to the smallest health centre but will also have a wider application wherever health and wellbeing is important, in places such as care homes and special schools. Following completion of Greenspace design for health and wellbeing, the practice was asked to prepare a set of case Studies for the FCS website. The Case Studies were based on those covered as part of the original research and included updates on projects which had developed further since the original site visits and interviews. 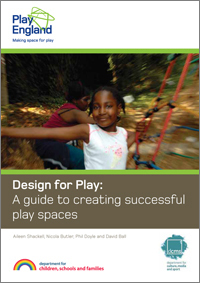 Aileen Shackell was the principal author of this document, which has had a major impact on the design of outdoor play spaces in this country. This publication was commissioned jointly by Play England and the Department for Children, Families and Schools (DCSF). It was published in summer 2008 and formed the main guidance for the government's Playbuilder and Play Pathfinder programme - the largest capital investment ever in children's play in the UK of some £235 million. In recognition of its significance Design for Play was awarded a Highly Commended award in the Communications and Presentation Category of the Landscape Institute Awards 2009. “The Design for Play document illustrates each design principle with further explanation and illustrative photos...many of natural playgrounds recently constructed in the UK, as excerpted here. A must read!” - a Chicago blog. Click here to download a copy﻿.